1. 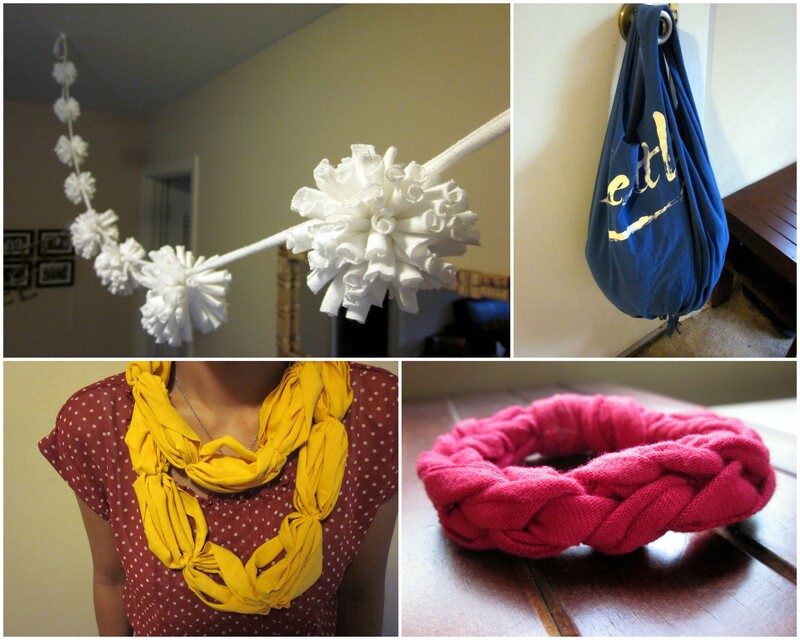 T-shirt Pom Pom Garland by Blog A La Cart – A men’s medium tee makes about five pom poms. Wrapping the t-shirt yarn around my fingers made the pom poms quite small so I went with wrapping it a little loosely 22-23 times around my iphone. I used a long piece of t-shirt yarn and knotted it around each pom pom for hanging. The most time-consuming part was cutting out the long strip to make t-shirt yarn. It seemed to go on forever! 2. 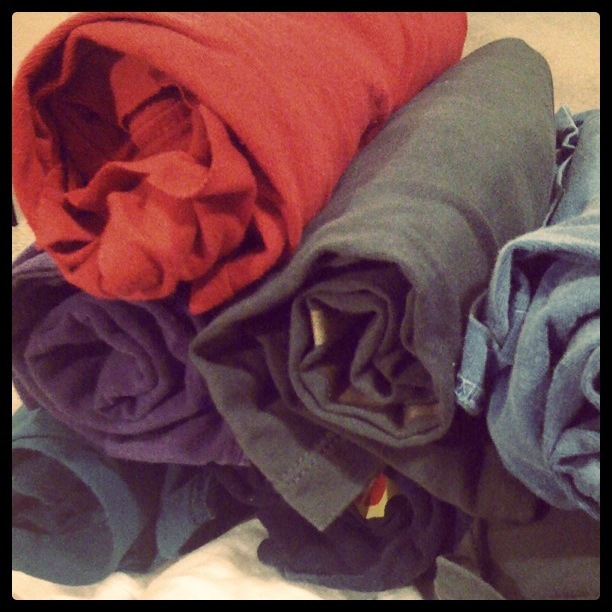 Tee Scarf by Shwin & Shwin – Using a men’s medium, I was able to get 15 rings and looped them into quarters. This was a quick project, maybe 30 minutes at most. It’s definitely past scarf weather here in Austin, but this will be a good fall accessory. 3. Jersey Knit Bracelet by V and Co. – I made the two finger version. I was a bit confused on how to connect the different strips so I ended up making an ugly knot when my strips came apart. 4. T-shirt Bag by Leethal – This was super easy and will come in handy at the market. 5. Rosette Jersey Bracelet by U Create – I’ve made these rosettes before for a friend’s wedding and think this would work well for a bracelet, necklace, or headband. 7. Knotted Headband by You Seriously Made That – except with T-shirt yarn. T-shirt yarn has so many possibilities, especially if you know how to knit. I’m excited for all the things we’ll make next week and the creativity my friends will bring. I hope you’re inspired to repurpose one of your old tees! This entry was posted in Crafts, Decorations, Gifts and tagged t-shirt crafts, t-shirt garland, upcycling. Bookmark the permalink. OK, super excited for sunday! I am bringing 500million old tees! Hahahha bring them all Phyllis! how cool. I think the knotted headband is calling my name! I will have to give it a try. Totally inspired! Thanks for sharing. Glad you liked it, share anything you make! these are crazy cute! def gonna make some! Would love to see anything you make!